Doug was born and raised in Zimbabwe where his parents were missionaries with TEAM. At a very young age he made a conscious decision to give his life to Christ. His schooling through most of high school was done in Zimbabwe, after which he attended Northeastern Bible College in NJ. In 1977 he married Nancy and in 1981 graduated from Trinity Evangelical Divinity School in IL and then served on staff at Calvary Evangelical Free Church in Essex Fells NJ for four years. 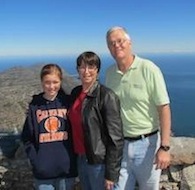 In 1984 he and Nancy moved to Zimbabwe where they continue to serve as missionaries with TEAM. Married to Nancy blessed with four beautiful daughters, Lindsey, Shannon, Julianne and Rachelle. Doug serves as Area Leader for TEAM Zimbabwe and Mozambique. This involves general oversight and some administration of TEAM missionaries and ministries in these countries. He is an active part of the ANESU team which works with God’s people in compassion based ministries. He is functioning as the team leader at this time. He is involved in the ministries of Karanda Hospital and Harare Theological College as a board member and he often provides pulpit supply for local churches. The people we work with and serve are a diverse group. They include missionaries and nationals, black and white, educated and illiterate, socially advantaged and socially excluded. Most live in the city of Harare although many have roots in their rural villages. The majority speak Shona as their mother language while many are quite comfortable in English. All of these folks are familiar with great hardships in life. All bear the image of God. All are loved by God. Pray for Doug’s spiritual vitality and fruitfulness. Pray for Doug to have God’s wisdom and enabling in his ministry roles. Pray for God’s favor on our family, scattered as it is and separated by an ocean.